One question I always get asked is how I come up with my plot ideas. Each book has a different story. For ERIS (Eternal Truths, Book 1), I wanted to see what would happen when a black heroine is tossed back in time. I love Time Travel Romance. Seeing the hero have to deal with, and actually acknowledge, that the heroine is (A) from the future, (B) not a witch, and (C) telling the truth that she is from the future is very entertaining. 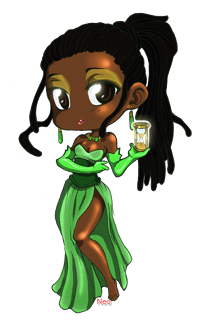 I originally started writing so I could introduce a black heroine to Paranormal Romance since I couldn’t find it anywhere. It was only a matter of time before I tackled Time Travel. Of course, I had to be careful. I didn’t want to send my heroine back to the United States slavery days. First, that’s way too much research that I’m unwilling to do. 😛 And second, it would be hard to write a believable interracial relationship in that time period without getting bogged down in the politics of the day. Something else I didn’t want to do. I decided to go further back in time to the Middle Ages, during the Crusading eras when Moors captured in battle were brought back to England as slaves, thus seeing a black woman wouldn’t be that odd. Once I figured out the time period, the plot grew from there.